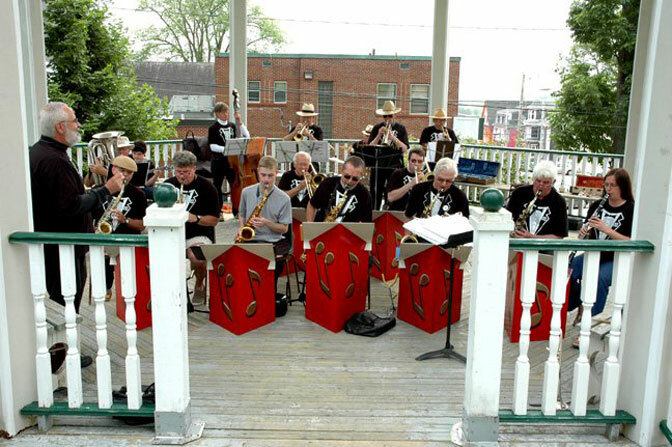 Information The Mahone Bay Legion Swing Band, or MBLSB, is beginning another year full of great music, energetic appearances and community support. If you follow our exploits, you would have attended a dance or two last year, or perhaps caught us in one of many local parades or at the Father Christmas Festival in Mahone Bay. Regardless, we know that we bring a tap to your toe and a smile to your face, whether from awakening memories of past times or just forgetting the events of the past 48 hours! Swing music has been making a resurgence in the past decade, with dance clubs popping up all over the place, from college campuses to downtown watering holes. Whether you are taking lessons now, or have just known how to jive ever since you were in bobby socks, you will enjoy getting out on the wooden dance floor at the Mahone Bay Legion when we appear. We usually put on 2-3 dances a year in addition to our Summer Bandstand Concerts every Thursday evening in July and August. Mahone Bay Bandstand, every Thursday night from 7-8 throughout the summer!